Japanese designers Atelier OPA created a unique set of products, which are perfect for small spaces. 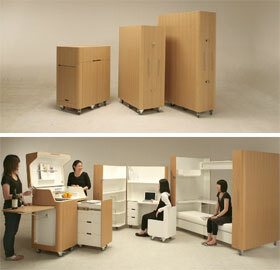 This foldaway set of furniture includes a mobile home office, a small kitchen and a guest room. When not in use, fold your furniture away and pack them in their case; an ideal small space storage solution. What I like about this idea is the fact that the user can easily set-up a private space by folding out the interior. It reminds me of a pop-up book – you never know what’s inside, until you turn the page and everything comes to life. Does anybody knows where can i find a link or something to buy this product? Their name is atelier Opa. We’ve updated the link at the end of our post. I want to know how much small house folding interior furniture. A very nice art and today’s need of the world, I want a franchise at Mumbai in India, please provide details soon. Hey, do you deliver to HK? Can you send me the pricelist of the items? Kenchikukagu Mobile and Folding Furniture available in the US ? Pretty cool, ha? Currently, not that we know of…. this is very intelligent, ingenious and space saving, of course. where do you sell this? im interested in this folding furniture where do i get more information? ?